Our programs are spread through many communities and schools throughout Kenya and Tanzania, East Africa. See our impact by year, and the growth of our programs. *Programs 2015 onwards include some overlap for students who may have been part of different module of the program in separate years. In addition to outputs of the program we do sample poll assessments of the knowledge acquisition and outcomes of our programs. We observe improvements in school attendance and performance, as well as reduction of early pregnancy rates. This contributes to high transition rates to secondary school. In the outcomes we see the girls improving their attendance and performance in the classroom. We use primary (Attendance, Pregnancy) and secondary (Academics, Transition) indicators to gauge this impact. Data in this dashboard is acquired from sample polls of schools in the program from 2014-2017. Pregnancy data is provided at a school level for all 24 schools. Granular polling at student /class level was done for subset of schools for academics, attendance and transition. 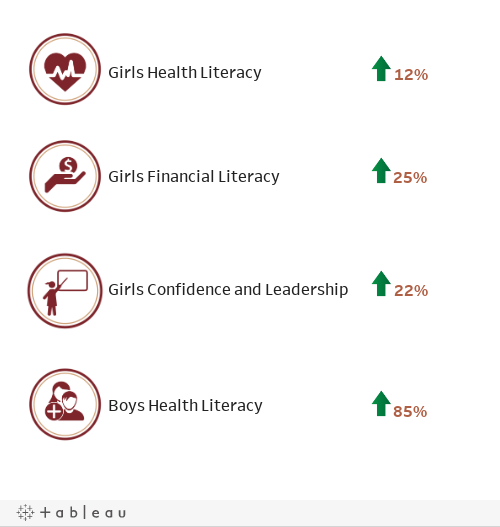 Girls and boys have shown improvement in the understanding of health, financial, and social assets after completing the Girls’ Advancement Program. We do baseline and end line surveys to assess knowledge acquisition of girls and boys during the programs. Data in this dashboard is from survey responses of 200+ girls and boys, during the 2015/2016 Project cycle in Kenya. * Because we believe in transparency, we are starting to share our data in real time. However, some numbers may not be up to date because of our collection schedule and the rural location of some schools. Data is collected monthly, quarterly, or once a year. Dashboards created in partnership with Statisticians Without Borders (SWB).